Remember the time we lost our 12 year old in the Swiss Alps? We left our Paris hotel early, and opted to utilize Uber, once again, to get us to the rental car company at Orly. While we had all eagerly wheeled our baggage on the train from the airport to the hotel, we were not as eager to do that first thing in the morning during rush hour! I decided months ago that I’d rather take off in a car for the French countryside from the airport and not from the city center. We reserved a minivan for our seven hour journey to Zermatt, but, as our luck would have it, they were out of mini vans. They were apologetic, and assured us that all five of us and our five suitcases (filled with our normal clothes AND ski gear) and our carry-on bags would all fit in the Ford Mendeo station wagon… the modern, low riding, wood-panel-free version of the station wagons of the road tripping 1970s. It was touch and go and a lot of cramming, but the car rental people were right- everything fit. It was a tight fit, with no view out the back and only foot room for the feet of an imp, but it all fit! I explained to the kids how lucky they were to spend the next 7 hours snuggled up together in the backseat, we took the discount they offered us for our downgrade, and off we zoomed! We were bound for the Swiss Alps! We stopped for a fabulous lunch in a town called Poligny. 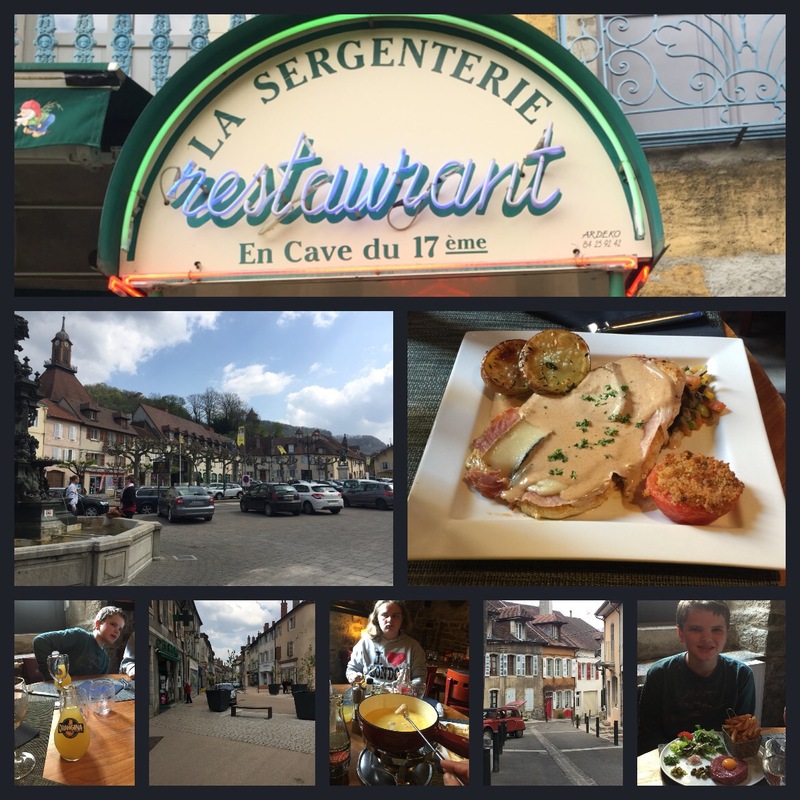 We ate in a wonderful historic restaurant, called La Sergenterie, which is built into a cave! We enjoyed dinner, and Noah, not to be outdone by his old man, ordered and finished his steak tartar. I enjoyed my first of three days of cheese fondue! 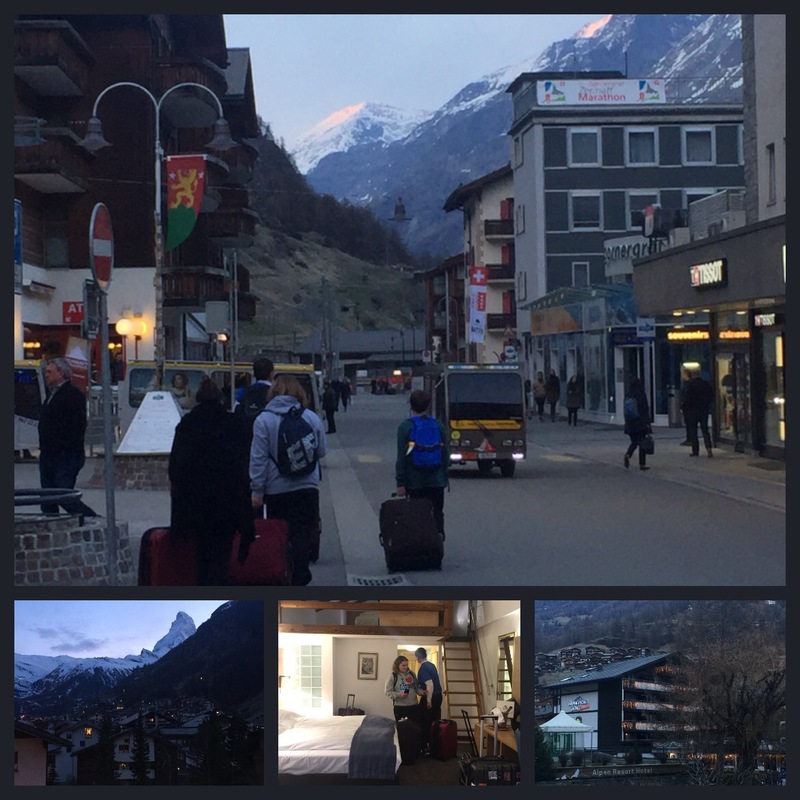 After what proved to be our “big meal” for the day, we continued our journey to Zermatt, Switzerland. It is important to realize that you cannot reach Zermatt by car- visitors must park in Tasche and take a train into Zermatt. 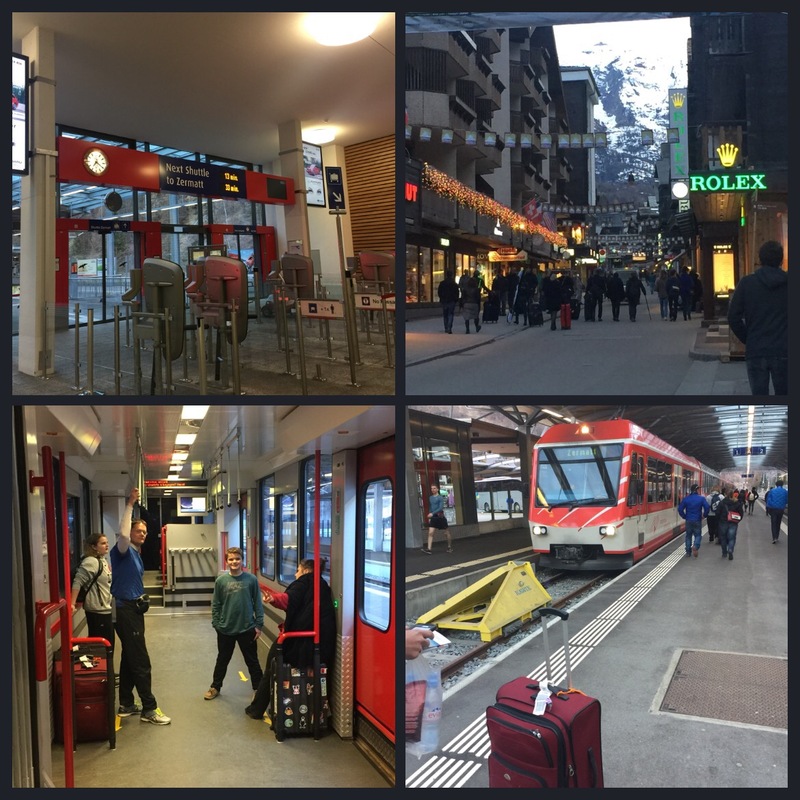 After parking in the train station parking deck, we purchased round trip tickets on the Matterhorn Glacier Express. The ride up was little more than fifteen minutes and the train dropped us in the middle of a bustling Swiss alpine town. We rolled our luggage down the car-less streets to our hotel- the Best Western Alpen resort, where we had reserved a family style room. We checked in and we’re thrilled with the accommodations. Our room had two twins and a pullout downstairs and a loft with two twins. The best part was the balcony, which offered us a view of the peak that makes Zermatt famous: the Matterhorn! We awoke the next morning eager to hit the slopes! 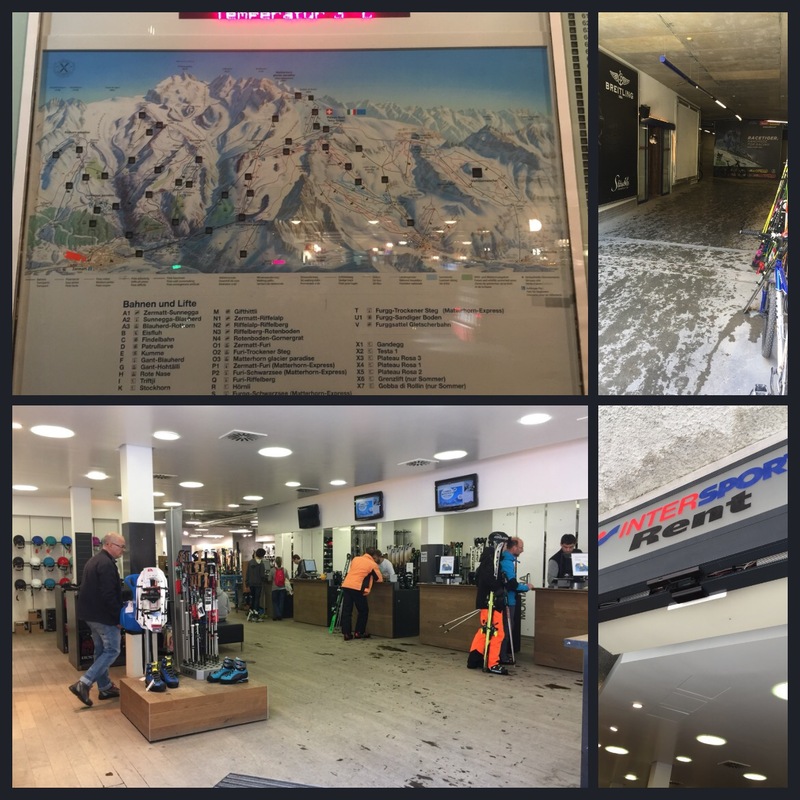 We opted for a shop next to the gondola, “Intersport Rent”and were impressed with the friendliness of the staff. With gear ready, and lift tickets in our pockets (the left tickets were magnetic cards that let you through the lifts by scanning them through your jacket pockets), we loaded into the “Matterhorn Express” gondola and rode up the mountain. 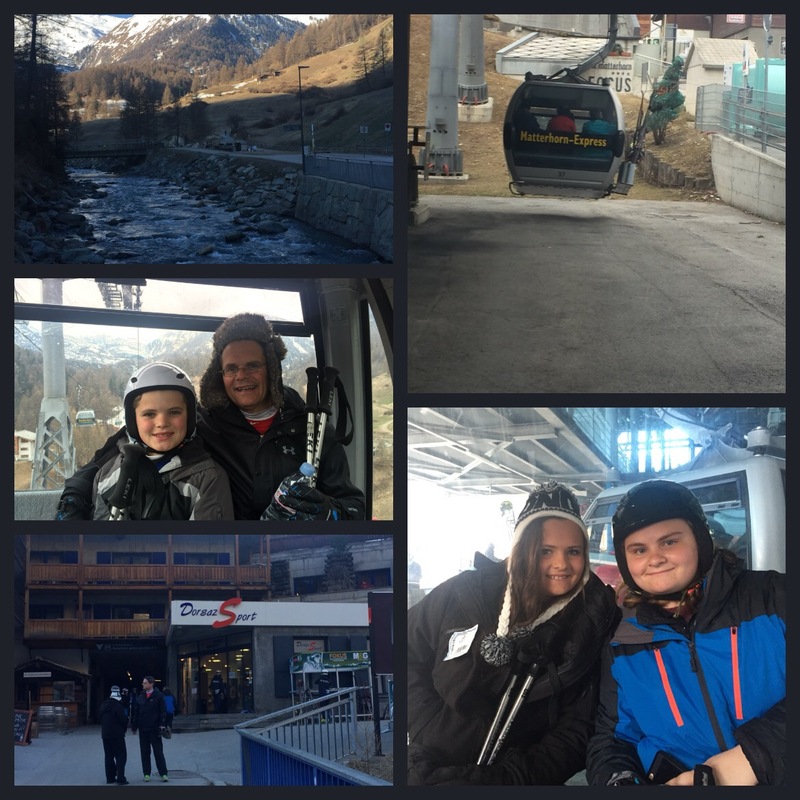 It took two gondolas and a five-person chair lift to reach the top. 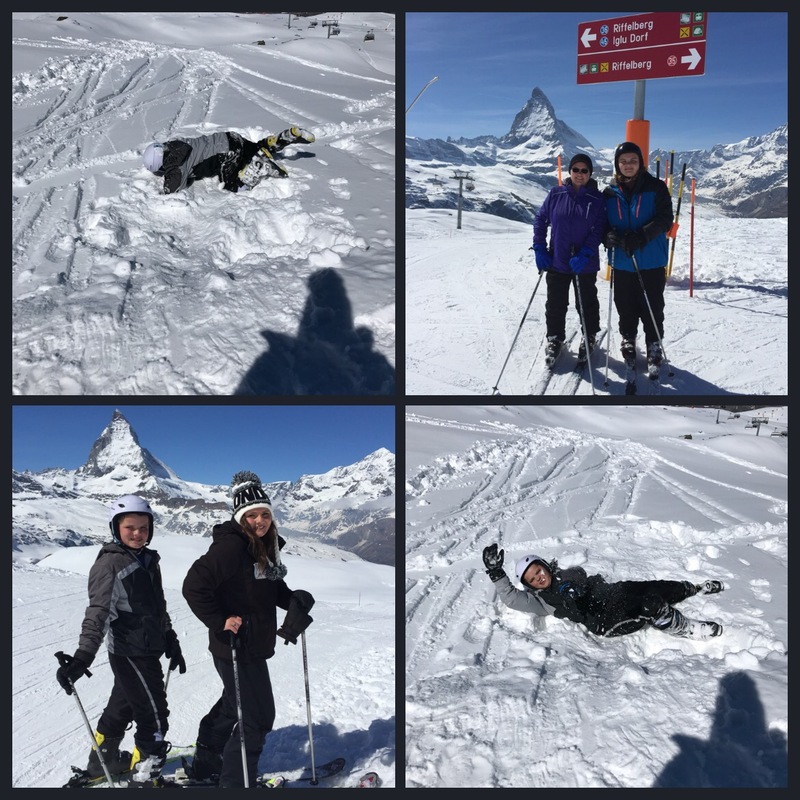 We skied off the lift and around the building before we truly beheld the snow capped Alps around us, all lapping the snowy sides of the iconic Matterhorn. It didn’t even look real, if I’m being honest- it looked like a backdrop painted by the most talented painter in the world. I tried to snap as many photos as I could, but none of the photos captured the absolute majesty of that scene. I could have sat and stared at that backdrop forever. 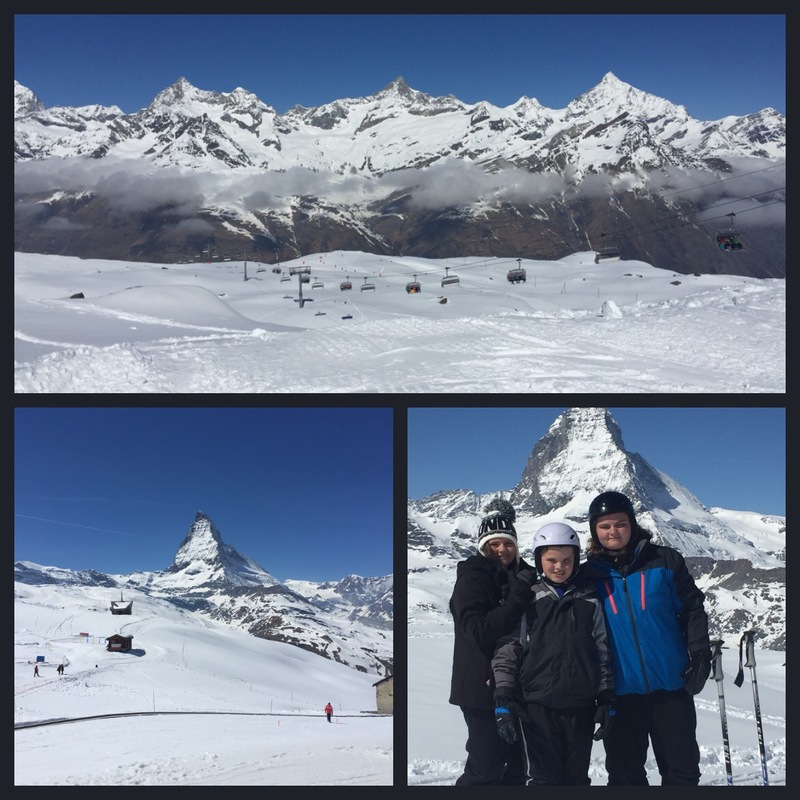 We spent the day skiing the Gorgenaut side of Zermatt- happily exploring the long, powdery runs. All the trails were clearly marked by level, and most were delightfully wide and uncrowded. In fact, many times I was alone on the run- as my family raced to the bottom! 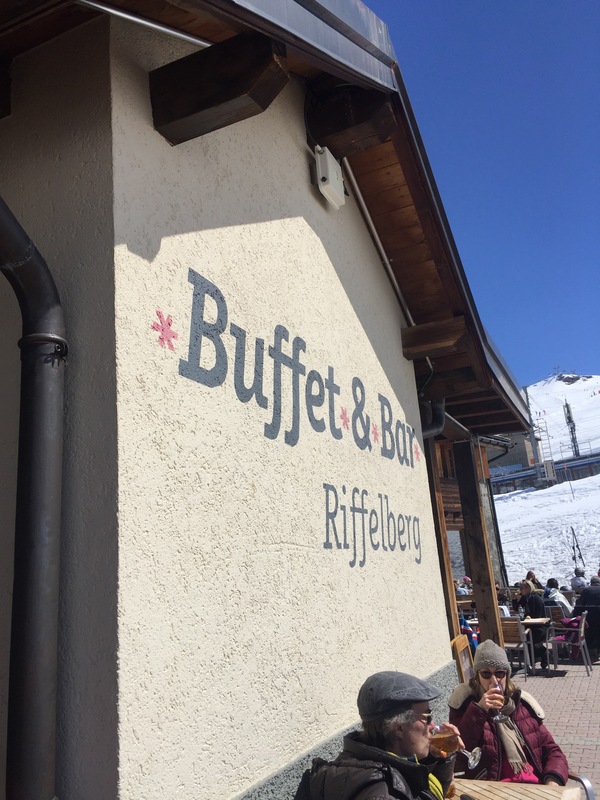 We stopped for lunch at a buffet on the mountain called the buffet and bar Riffelberg, before realizing we lost Noah! Jim and Hannah skied back to the chairlift, and I waited with Molly in case he might find his way to the restaurant. Hannah and Jim found Noah- he had no idea we were stoping for lunch so he had gone up to the top again- by himself- and come back down- not the least bit concerned. Boys! The buffet offered plenty of hot and cold options, but they charge for everything- including ketchup packets and NAPKINS!? Use your sleeve, kids! We skied until the 4:30pm closing forced us from the slopes! My forty-five year old muscles were burning and pulsating, and I cursed them for not being better sports! 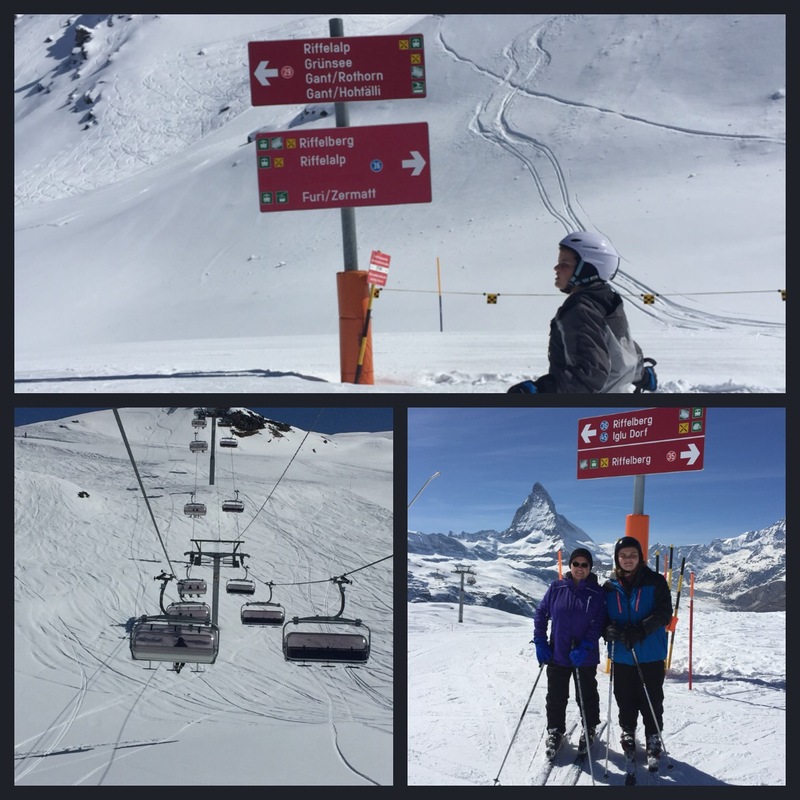 Given my aching body, and Molly’s overall lackluster feelings about skiing (she was an excellent sport about this adventure however), she and I decided we would spend the next day exploring Zermatt. We returned our equipment to the rental store and felt excited to take on the morrow! The evening ended with a dip in the hotel hot tub and a visit to the sauna! 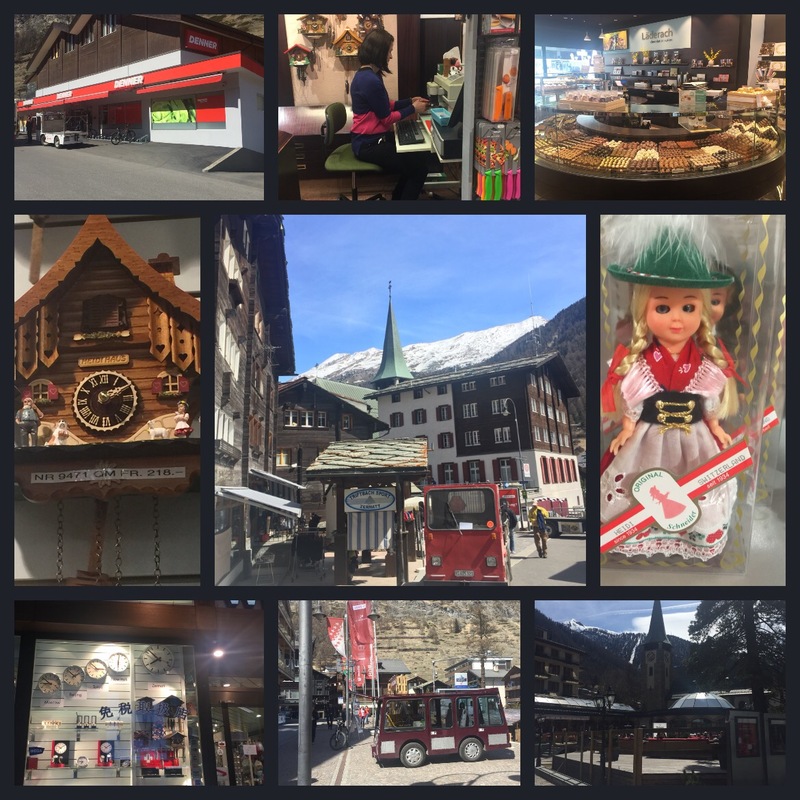 We wandered the streets of Zermatt, exploring shops and eateries, and talking with local shopkeepers about everything from Swiss Army knives to cuckoo clocks. I quickly realized that my name is quite popular in the Swiss Alps- and lots of products bare my moniker! By early evening, the rest of the family returned from their day on the slopes. They were eager to share the adventure stories of their days- their faces ruddy from the wind and sun of the Alps. 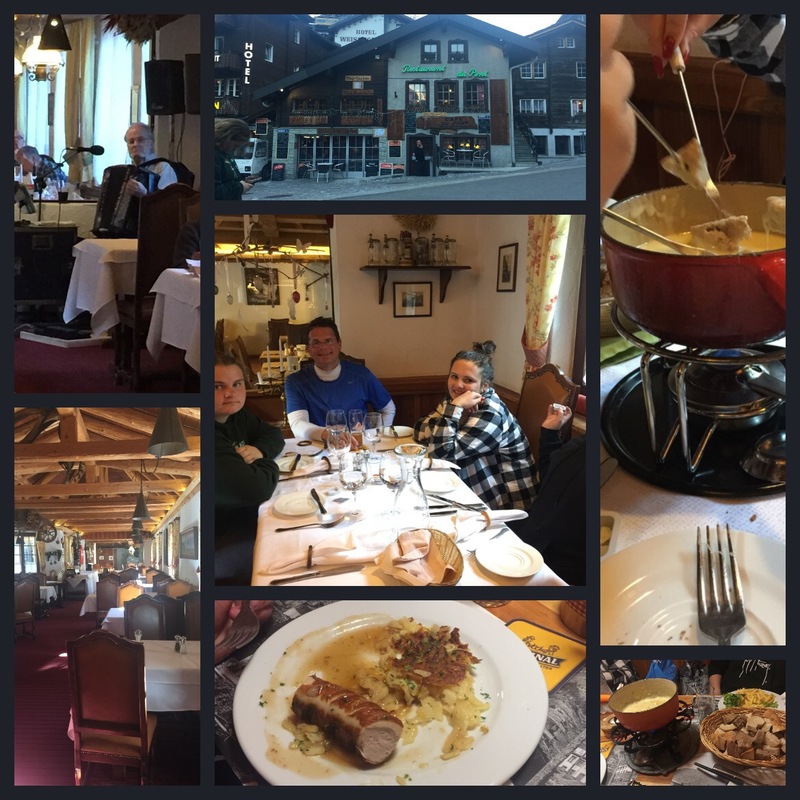 We shared experiences at a neat little restaurant in Zermatt called the Restaurant du Pont, where I enjoyed my final cheese fondue. The next morning, Saturday, we were packed and headed to the train station by 7:00am. Our flight was leaving Orly at 7pm, so we traveled back to the city. We flew from Orly to Heathrow, and checked into the Heathrow Marriott for one final evening. We ate a late dinner of fish and chips- maintaining the mantra of “when in Rome”… and hit the proverbial hay! The final morning, we opted to Uber to Hyde Park, where we wandered in and out, then walked up the side of Green Park all the way to Buckingham Palace, where we waited with the crowds to see the Changing of the Guards! 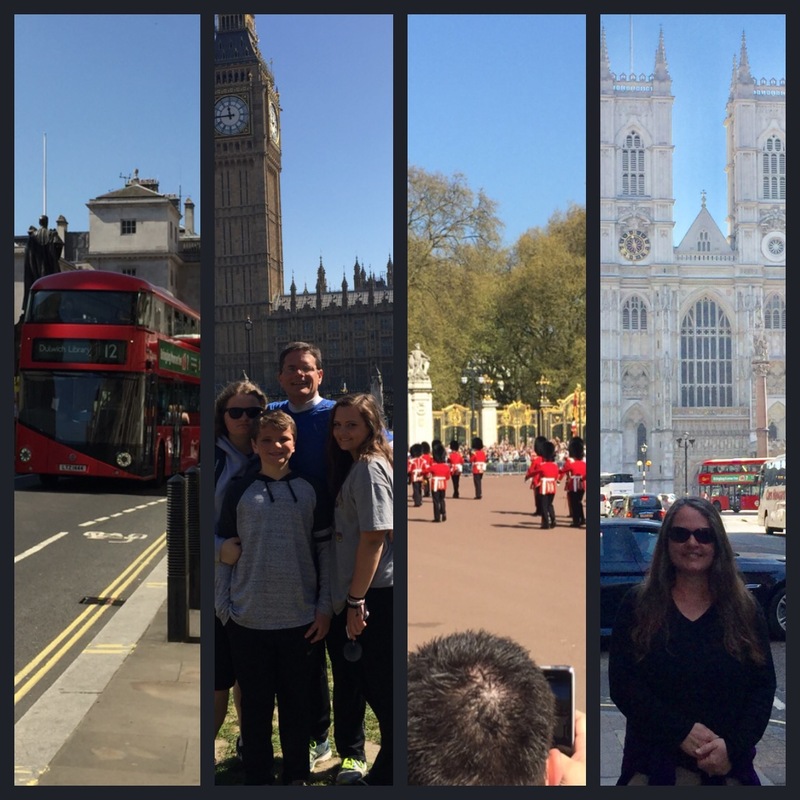 From there, we went to Westminster Abbey and Big Ben before heading back to the hotel to check out. Heidi A. Campbell Teaching high school English and Journalism has certainly shaped who I am. I like to think it keeps me relevant- hip to what's what. I was born and raised in Maine, and I never miss a summer on Birch Island, a beautiful place on Casco Bay between Harpswell and Brunswick. I moved south and got my B.A. in English from Oglethorpe University in '94. Several years later, I returned to the world of academia with a stint at UGA, where I received my M.Ed. I have a great family. I love comfortable shoes, good books, poetry, traveling, music, cooking, and antiques. I rent space at a local antique shop, a perfect outlet for my passion for old treasures! I enjoy my local book club, I sponsor my school's Debate Club, and I advise both my school's newspaper and Lit Mag. I am a Feature Writer for "Our Town" magazine, I recently published a study guide and teacher's guide to accompany Rennie Curran's book "Free Agent", and I freelance as copy editor for a local doctor's office. My experiences and interests bring me into contact with an amazing variety of people and places. Sometimes, these people and places inspire, sometimes they enrage, and sometimes they change who I am. I love every minute. This blog is for those times when, in the words of Cat Stevens, "I can't keep it in... can't hide it and I can't lock it away..."